EUR is acting stronger against USD due to the Eurozone inflation rate and Positive Markit Services and Composite PMIs in Germany and France. The support rests at 1.04860 with resistance at 1.05460 which the weekly pivot point at 1.05140 is located in between the lines. The EMA of 10 is rising sharply along the ascendant channel but it is below the EMA of 100 and EMA of 200. The RSI is moving in overbought area, the Stochastic is in its highest rate and the MACD indicator is in neutral territory. The ADX is showing a strong buy signal. The price has reached the 61.8 level of Fibonacci therefore pullbacks can happen at any time soon. 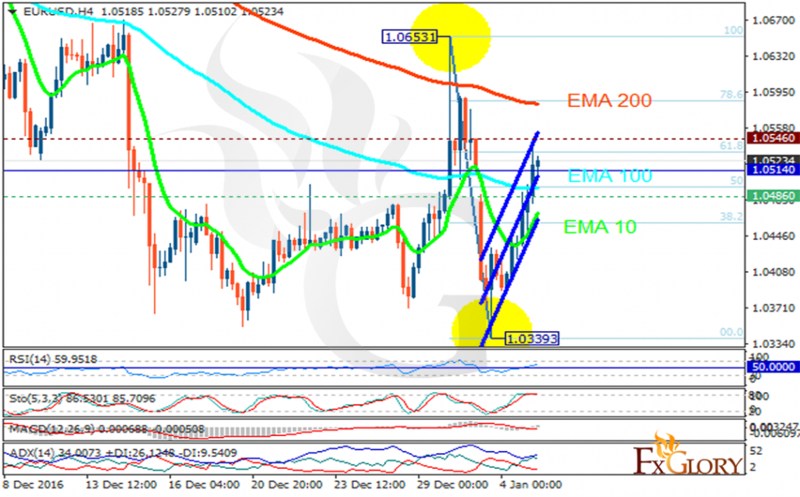 The pair will reach 1.0550 level but it will decline targeting 1.0350 for sellers.